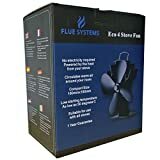 So, you want to increase the heating efficiency of your home and are interested in finding the best stove fan on the market. These ingenious devices recirculate up to 80% of the hot air that would otherwise be lost up your chimney. If that sounds interesting, then I have a selection of products you should take a look at. Let’s dive into the nitty gritty with all of these fans and see whats what for your stove heater! VODA is a well-known name in its niche, one that has been around forever. So who better to kick things off with one of its wares. Let’s take a look at a few of the pros and cons that you need to know all about. The great thing about this device is that you don’t have to rely on a battery to power the motor. That means no nasty surprises in your electricity bill and your, living room can be nice and snug this winter. In fact, this piece of kit is a perfect companion for a log burner, as increases its reach. Do you need a professional to fit it? The answer to this question depends on your confidence. However, for some, it’s just a case of sitting it on top of a stove or log burner. After which it’s a matter of just sit back and enjoy the extra warmth. However, never place this device on a none flat surface. Additionally, its normal operating temperature is 85C – 350C. So, If you expect things to get a bit hotter as in +350C, remove the fan. A big thanks to VODA for crafting a solution for inefficient heat distribution from log-burners. On first testing, you will notice that heat reaches parts of your home you never expected it would! Meaning that almost all of those cold spots you dared not tread will be gone! The robust design is perfect for those of you looking for an extra option without the need to spend more on heating. Additionally, it’s the ideal start to a green/eco-revolution at home; you too can do your bit. Second on my list is the latest Valiant stove fan on the market. Again we have a name that’s known across the industry for quality, so continue reading to discover what I found out. Able to fit into the tightest of spaces, this device at 199mm surprises many when it starts working. However, its biggest positive, (in my opinion,) is the low starting temperature. By kicking into action at only 50-degrees, it gets to work the moment the kindling catches fire. Can push over 420 feet per second but can others do more? As I mentioned above, yes, it’s small, but it’s certainly worth considering. This little hot air distributor features an innovative 4-fan design, which has been engineered to take advantage of advanced radiating. By that I mean it can push up to 70% more airflow around your home than its nearest competitors. And that means if you want to maximize airflow you can’t do any better at this size! The compact design means it can be fitted with ease by almost anyone – although I would advise you to read the instructions. Additionally mainly take note of the operating temperature notes and installation details. All-in-all the amount of air this fan can push is a real winner for me. Yes there are bigger options, but you don’t have to purchase more than you need to get fantastic results, and save money! Next up is a triple blade offering from VonHaus. If you want to be able to answer the question ‘how do stove fans work?’ then all you need to do is take a look at this clever piece of design. Silent operation means you’ll never have to turn up the TV ever again! Imagine reading a book with the constant hum of a fan in the background! Yes, that would be annoying, fortunately for this fan that will not happen, because it runs almost silently with only the faintest of sounds. Combine that with the thermally activated (50C,) running performance, and you’ll see a steady drop in your monthly heating bills as the winter months arrive. Self-regulating operation: but how well does it work? Self-regulation is all well and good, but is it as good as central heating? Yes, it is capable of pushing warm air around the entire home, but if want instant heat? I would suggest you have a thermostat fitted to control your radiators to help balance things out. If you’re a little sceptical about a device which won’t break the bank, don’t be. After research and testing, I can tell you it will do the job. Not only that, for what is a relatively low price, you get a sturdy, well-built tool, one that will make a difference to our home. Additionally, if you’re looking to take a step in an eco-friendly direction, you couldn’t go wrong, as no electricity is required. Energy efficiency is a well used ethical term these days, and what with global warming are you looking to reduce your footprint? Fortunately, with this 4-blade you can make a good start and heat your home without the need for batteries or the mains. Why use a fan? Let’s be clear – log burners are great, but most keep the immediate vicinity warm. And that means if you have a large room, in the winter you may have cold spots! So, what this VanHaus option does is push that static heat around your room. Furthermore, some users have reported heat travelling up their stairs. Meaning, one little device can make a massive difference, so you may even be able to keep the heating off. Ok, so silent operation and auto-operation are seemingly pretty standard so far among the fans I have listed. But, don’t let that make you complacent about them, as different materials and build quality will ultimately make a difference. Regarding auto-on, once your burner gets up to 50C, the fans will begin to operate. Although beware that its optimal temperature range is 50C to 350C. And like previous models, if it gets hotter than that top number, move it, let it cool down! What can I say other than, it does what it says on the box? That it helps to improve the distribution of warm air, which it does well. Yes, there is some question as to whether VonHaus could have given it a little more power. Why? Because, its throughput (the amount of air it moves) doesn’t match some of those previously mentioned. However, that is the only obvious niggle I could discover! Tomersun was a new name to me when I began this review. So, let’s take a look and see what it can offer compared to its competitors. The level of Aluminium engineering that is on offer here is impressed that impressed me. Meaning, by the looks of it, the device should provide hassle-free and dependable operation. Why? I think it’s all down to the quality of manufacture! As it appears that Tomersun, has left no stone is unturned when it comes to the shape and fit of all the moving parts. For me, design and build quality are the first thoughts. So, with that out of the way and this fan off to a good start lets move on. Ok, so it is clear that thermoelectric technology which converts a temperature difference into electricity is standard. So, as this device like the others features it, you know there’s no need for a plug socket. However, what is different from the previous is the temperature at which this device kicks in. Unfortunately, it’s not 50C, like the others, no, you need to get your burner up to 85C for this device to start working. However, like its competitors has a maximum operating temp of 350C, and hotter and you get no benefit. In fact, it may irreparably damage the fan. Useful for log and coal burners this fan comes pre-built, so there’s no need for any setup. My advice is pre-heat your fire before placing the fan the first time around. That way you can instantly get to feel warm air being moved around the room. The Voda Heat Powered Stove Fan does it so well! Now that we’re just past the halfway mark, we have the latest offering from VODA. Let me start off by saying if you’ve got a small room say, 7×10 may be a little bigger, take notice. As this fan, has been developed for you! How quiet is silent? In my book, it means no noise at all! However, while this VODA does it’s best to keep fan noise to a minimum it has issues! As in, it is susceptible to vibration noise via the fan hub and blades coming into contact. Why is this? Well, it could have something to do with material expansion at high temperatures. My advice should you purchase this device and experience the above issue, is to move the hub away from the blades. Apparently, doing so is a pretty easy fix. Some people think these types of device are all about reinventing the wheel, but this couldn’t be further from the truth. When you want to get the most out of your log burner you need to stop the majority of the heat going out the chimney. In short, this is what this piece device does, and it does it as well as any item I’ve listed. Apart from its innovative design and size, the sound niggle I mentioned does slightly take away from this fan. However, from my research, it is not a problem seen by the majority of owners. So, I say, maybe there was a faulty batch that did not get picked up. Maybe you could give it a try. After all, it won’t break the bank to trial it. The Fluesystems Eco 4 – does what it says on the tin! With a word like Eco in the name, you would not be questioned for thinking this could help you become somewhat environmentally friendly. So, now let’s take a look to see if the name lives up to that assertion. Low starting temperature branded as Eco at 50 degrees! 50C is considered a low auto-starting temperature; however, it is not unique, nor is it all that Eco! As with previous models, a thermoelectric module acts as a small generator to power the fan’s motor. It kicks in once your log burner ramps up to 50C. As for what is Eco, as in protecting the environment, that is the use of no battery or mains electricity. Yes, thermoelectric technology is magnificent; however, a fan in your home is about all it will help you with. The design is compact and rugged which ticks off two big boxes in my opinion. Depending on your aptitude with technology it should be plug-and-play, although there are resources for assistance. Great name, even better product. Undoubtedly worth a closer look if you want something that will get the job done without any fuss. And no it is not particularly any more Eco-friendly than other models. You should know that at 185mm High x 180mm, wide, this is a small fan which is intended for use in small rooms and with small to medium sized burners. 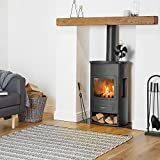 One problem that many people report before buying this product is that their living room mantle heats up via the stove. Fortunately, this device moves just enough air to prevent that from happening. As with the majority on this list, the JKsmart needs no mains or battery power, just raw heat from a log burner. And as you would expect after a few minutes it gets up to temperature and the fans begin to spin. But, does it stand out from the rest, or are they all practically the same? Look at that energy rating, I’m assuming that this device has an amazing warm air throughput, meaning although small it can heat large rooms. You’ll notice that it comes with an inbuilt thermometer which will tell you if the temp is right. In fact, why not watch it reach 50C and see if the fans begin rotating! While some fans which operate at the lower end are afflicted by slower fans speeds, the JKsmart is not one of them. Its blades are designed to rotate at a maximum of 1250rpm meaning it among the best. This fan as with the others has a max operating temperature, as such, it has built-in heat protection. Fortunately, like some others, it doesn’t kick in too early or continue running without need. That means, you never experience the temperature spiking fast and then drifting aimlessly for the rest of the evening. Stove Fan bling!! Yes, you read that correctly, someone somewhere cooked up this idea! Do you need a gold fan? Fortunately, looks aside, there’s more to this fan than meets the eye, here’s what you need to know. Every design that claims to be Eco-friendly always gets tested to the max in the end, and for good reason. When you want to be able to get the most out of your burner you need a fan that will cope with the huge temperature swings. Comes with all the mod-cons you would expect, heat-powered, eco-friendly, noiseless operation, auto-operation, and of course, those golden blades. Which, I may add seem to offer no improvement what so ever. Meaning, they are for the purposes of, standing out, from the crowd … Bling!! A huge plus is, when you take it out of the box, it is set up for you. So, all you have to do is keeping stoking the fire, and it’ll do the rest. One small negative is the manufacturer’s size measurement, at 21cm it should fit into the smallest of places. 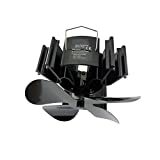 However, in actual use with the fan blades attached it reaches 23cm, so keep that in mind. Last but not least on my list is something a little different, it’s not got 3-blades, 4-blades, no think double. That’s right 8-blades split into 2x four making this unique on my list. For one reason or another, it’s been making a lot of noise. So, I couldn’t bear to leave it out, here’s what you must know. Yes, you guessed correctly, this fan benefits from having no power input requirements. Well, that is via conventional means. Instead, it relies on a heat sensitive spring. As a stove heats up so does a metal strip and the spring, and at the top, a metal strip remains cool. When the spring reaches a specific temperature, it bends forward bringing two strips of metal together. And it is this connection which enables the flow of thermostatic electricity and the blades to turn. According to some users, this fan can suffer from cracked blades when a fire heats up quicker than expected. That is due to impurities in the metal body expanding at different rates and causing excessive stress on the main structure. Will you experience this issue? Let’s be clear, I do not know, as the problem could have arisen due to a manufacturing fault which is fixed. Meaning that the product you purchase has no such frailties. A product that’s as easy on the eye as it easy to use. Highly recommended for those of you who want a product which can be taken out of the box and used straight away. As for the fan itself, personally, I think, if it can push more warm around with those 8-blades you can’t lose, after-all it has all the features of the others! So, there you have them, 10 of the best stove fans money can buy. Have you decided which is for you? If so, congratulations, as during my research, I discovered that the majority are more similar than different. As such, if I were to give some purchasing advice, it would be to read more reviews. And most importantly, make sure you have accurate measurements. After all, you don’t want a shiny new fan delivered only to discover it’s too big or small! I’m Shaun Baird. The site owner and co-ordinator. Behind me there is a small, but very dedicated team. Shaun set this site up in 2016 to help discover what really does work. The rest of us work behind the scenes testing and analyzing stuff. We also enlist the help of experts within their fields as well as grab feedback from real life consumers of the products we test. We’re pretty cool like that!